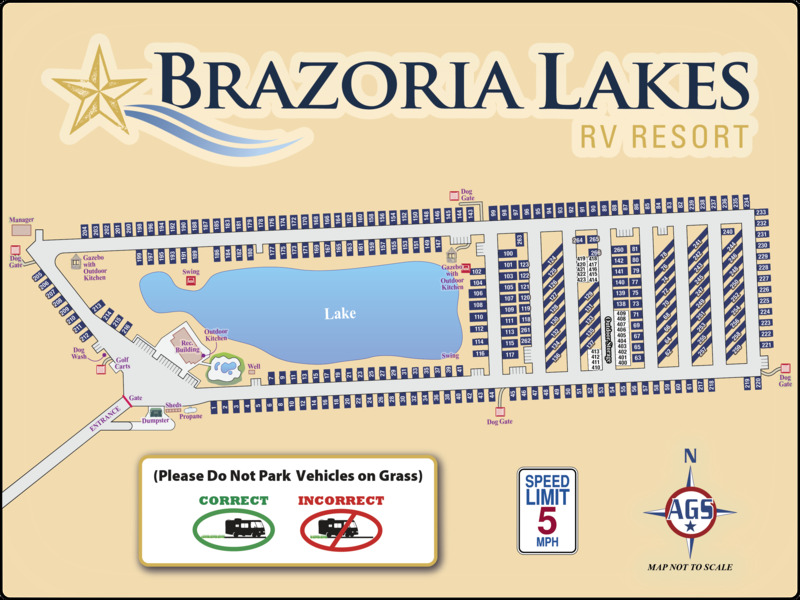 Ask fellow campers about "Brazoria Lakes RV Resort" and nearby attractions. Overall we would be happy and content to return. Everyone we encountered were very professional and cordial. The rules of the park were very reasonable (including a fee for not cleaning after your animals). My issues were: 1) There was dog poop in my back yard. The staff should take the time to clean up and have sites ready and CLEAN for customers. 2) the Wi-Fi simply stunk. I used my hotspot and ad immediate surfing which was not the case with their Wi-Fi. If not for these two issues I would've given a higher "overall rating"!! We camped at Brazoria Lakes RV Resort in a Fifth Wheel. Local stores were friendly and sufficient for our needs. Walmart was 22 miles located in Lake Jackson. Nice level concrete pads, big park, some permanent residents, pull through was ample for 40ft MH and a car.. Dog park was actually in a cow pasture which is ok, but not fenced in from the cows... can't let dogs run...very clean, nice areas around lake that had fire pits...not much to do in Brazoria after going to the beach to see the ocean... Galveston not too far away.... We camped at Brazoria Lakes RV Resort in a Motorhome. This park is amazing!! The amenities are awesome. They have everything you could ever need. They have golf carts for rent, free dog baths, pool, lake side sites, etc. The personnel is way beyond friendly. They were awesome. We loved our stay and were treated like gold. Way to go Bazoria Lake RV campground!!!!! We camped at Brazoria Lakes RV Resort in a Motorhome. Greedy, rude owners. NO Wifi! Green Algea in their water! Several campers damaged here, & They have you sign away their liability for your damages at check in. Still under loud construction, equipment and workers. Worst place we've stayed! They charge the highest per kilowatt in this area. With No Shade, Power bills are close to $300 a month! Ongoing Sewer problems. They've left a hole full of water and exposed pipe not properly roped off for a month now. Mowers come thru in shifts so it takes all day Sat, with noise and grass trimmings everywhere from 7:30 -6. Any complaints will be directed to the corporate office, who will not return your calls. We camped at Brazoria Lakes RV Resort in a Travel Trailer. 15 minutes from Lake Jackson. This is a great park with excellent managers. It has "it" all; gated w/ 24 hr. coded access, water, sewer, power, cable, WiFi (not consistent), pool, laundry, everything cleaned often, level concrete sites with parking area and picnic table, lawn space between sites. New landscaping so don't drive off the concrete. Do need to improve (fence) their dog walks. We camped at Brazoria Lakes RV Resort in a Travel Trailer. 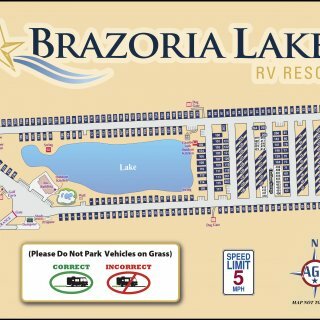 Are you affiliated with Brazoria Lakes RV Resort ?